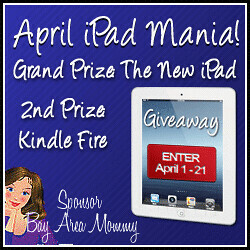 WELCOME TO THE APRIL iPAD MANIA GIVEAWAY!! !Ohayo Okasan has teamed up with Bay Area Mommy who has teamed up with some other awesome bloggers to bring you this amazing chance to win the two hottest tablets in the market today! Open worldwide. Must be at least 18 years old to be eligible for the prize. This giveaway is in no way sponsored, endorsed or administered by, or associated with, Facebook, Twitter, Apple or Amazon. Winners will be drawn on April 22 and will have 48 hours to respond to the notification email. Kindly include alice@bayareamommy.com to your email’s whitelist to make sure that in case you are picked as the winner, the notification email would not go to your Spam folder.